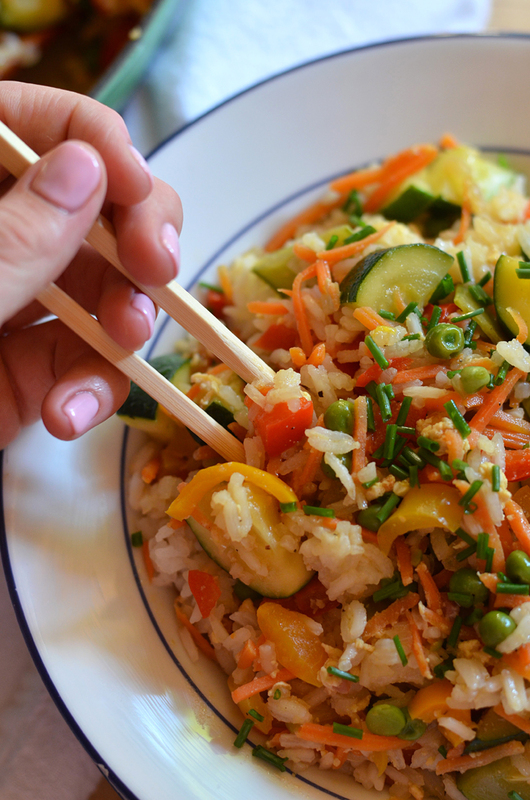 Okay people, yes, yes I know... Asian food from the whitest family in America? YES! 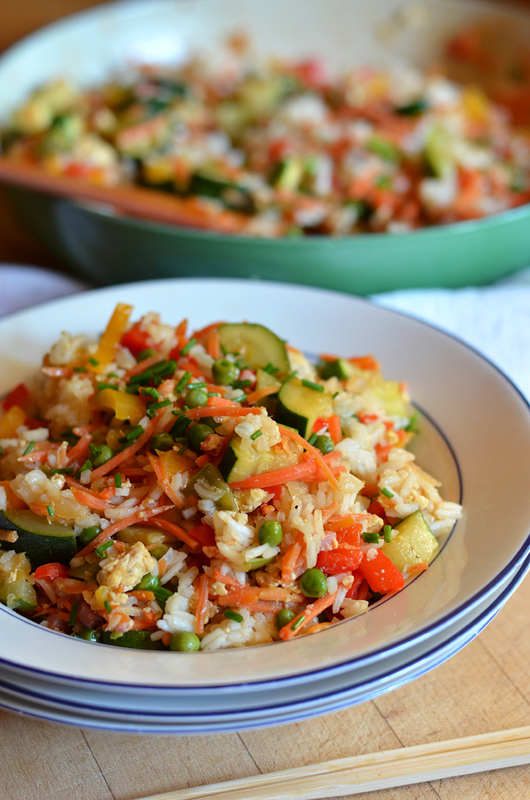 Let me tell you, this vegetable and rice stir fry is seriously the best! My family makes this for dinner at least every other week, that's how good it is! 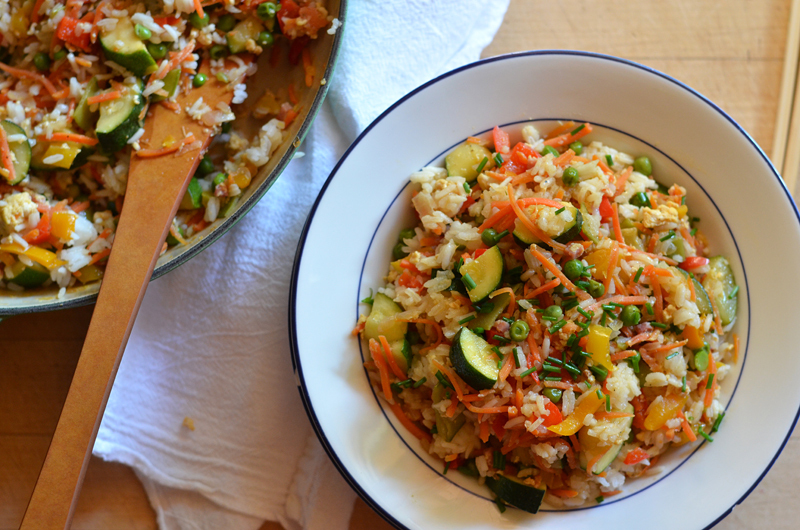 This stir fry reminds me of hot summer nights where we whip up this stir fry and eat it out on the patio. 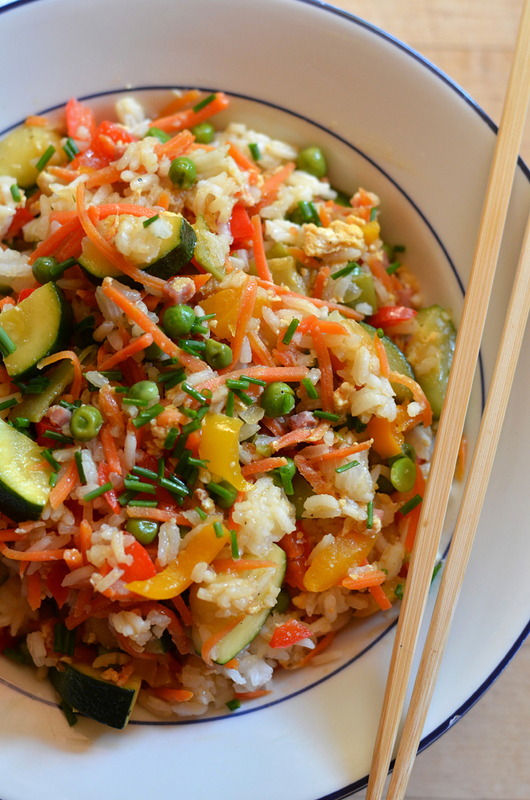 This stir fry is the perfect healthy and delicious dinner for summer when you have fresh vegetables. This recipe is more like guidelines, feel free to toss in any type of vegetable you have available! Just add them according to cook time (if it takes longer to cook, add at the beginning and vice versa). 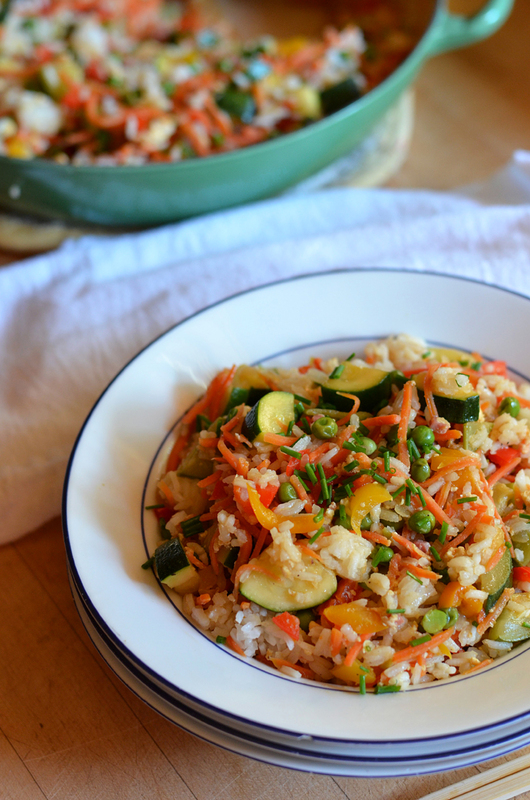 I love how easy and healthy this one dish dinner is, I'm sure you will too! 1) In a large fry pan (or wok) on high heat, add olive oil, onion, and garlic. Stir constantly until onions are tender and garlic is fragrant, about 3 minutes. 2) Push onions and garlic to the side of the pan and scramble eggs in the same pan. When the eggs are done, remove and keep warm in a separate bowl. 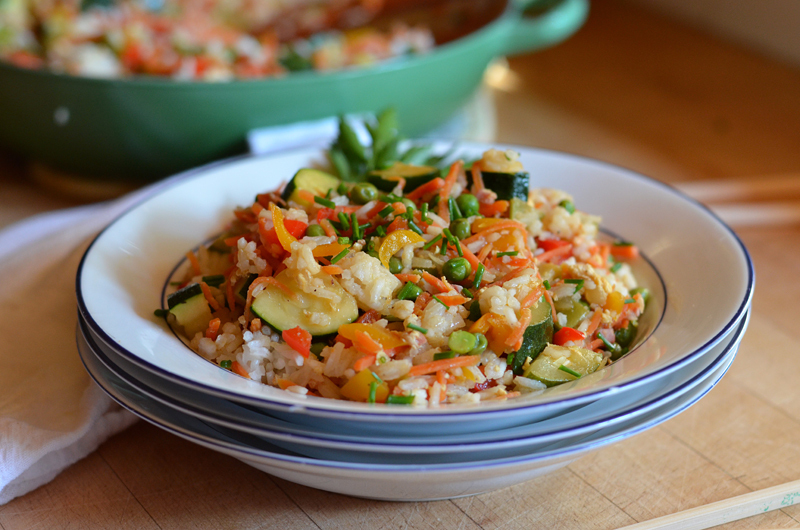 3) Add vegetables, starting with the firmest and ending with the most tender. 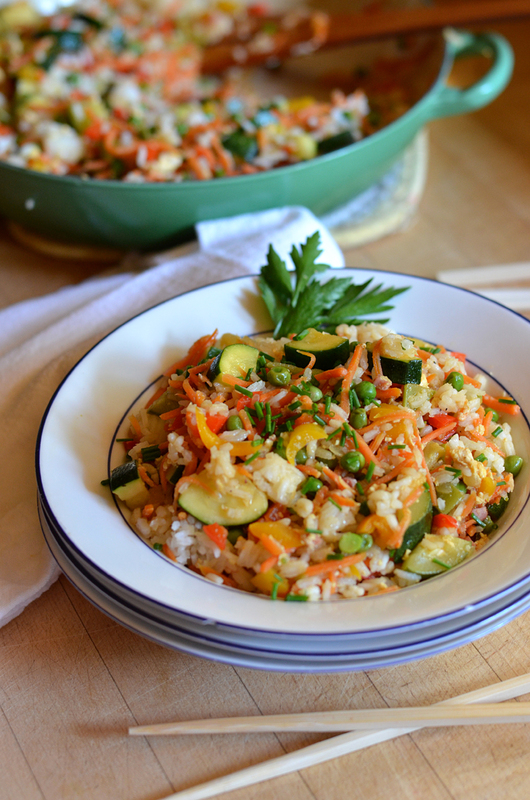 (We start with carrots, then add zucchini, bell pepper, asparagus and peas). Let all vegetables cook until tender, stirring often. Add lemongrass to mixture and stir to combine. (If vegetables are sticking to the pan add more olive oil). 4) Add soy sauce, white cooking wine, and rice wine vinegar. Cover and cook for 1-2 minutes. 5) Add cooked rice and eggs and stir all together. 6) Salt and pepper to taste. Serve and enjoy!